Hopefully you’ve been paying a little attention over the last few weeks of worship. If you haven’t, I encourage you to go back and check out the gospel readings from the last several weeks again. Maybe use it as part of your prayer and devotion time this week. We’ve heard about a slave, a dead man, a sinful woman who might even have been a prostitute, and today a madman possessed by a demon who identifies himself as “Legion.” Which indicates that it’s not just one demon, but probably thousands of them in this man. This section of Luke’s gospel piles one exciting story on top of another. This isn’t a time for summer vacation brothers and sisters. It’s time to experience first-hand how Jesus widens the circle of the people of God to include those who are seen as contaminated and outside the community or dirty and unclean. You know who I’m talking about, people like you. People like me. The characters in our gospel readings over the last month or so reflect somebody that we’ve all seen before, somebody we may even know. And ultimately, somebody who forces us to open our eyes and take an honest look at ourselves. But usually we live more like the couple from Good Shepherd as they drove through the mountains of western Montana over Memorial Day weekend. “Every time he raced around one of those narrow curves, I was scared half to death.” is how the wife of this couple described the weekend experience. If we define “demons” as forces that capture us and prevent us from becoming what God intends us to be, then I believe that you and I are surrounded by – even possessed by – as many demons today as those that Jesus encounters in the Bible. Our demons take many forms: mental illnesses, addictions, obsessions, destructive habits, accumulation of material possessions, and many other things that you are thinking about right now. If we look at other Gospel stories of “demon possession,” all the demons Jesus confronts have three things in common: they cause self-destructive behavior in the victim, the victim feels trapped in that condition, and they separate the victim from normal living with family and community. Sound familiar? Don’t many of us suffer from the same kind of burdens? Notice the similarities between the demon-possessed man in today’s gospel reading and the demons that possess us. The demons hurt him and cause self-defeating behaviors. Don’t our own obsessions, addictions, bad habits, even resentments cause self-defeating behaviors that hurt us, and others, deeply? They can cause us to feel bound up and trapped, flailing to free ourselves but powerless to know how. The man in our story today is cut off from all things that enable him to be human. He doesn’t live with people or in a home, but “in the tombs,” probably in caves that were used as burying places like what we would know as cemeteries. He is “driven by the demons into the wilds.” In other words, he’s experiencing a “living death,” separated from people and normal living. When you and I are plagued by our own demons, don’t we feel dead inside? Don’t we feel separated from ourselves? From others? From God? To any of the demons that possess us, the message from Jesus, today and in all days of our life in Christ, is one of hope and new life. 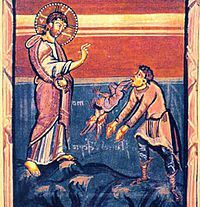 So the point of the story before us today, and really of all the demon-possession stories in the Gospels, is that the power of God can cast out demons. That’s a key to the success of programs like Alcoholic Anonymous. The twelve steps of AA begin with these three: 1. We admitted we were powerless over our addiction, that our lives had become unmanageable. ; 2. We came to believe that a power greater than ourselves could restore us to sanity. ; 3. We made a decision to turn our will and our lives over to the care of God, as we understood him. Alcoholism remains a great problem – a great demon if you will – in North Dakota and the United States. It’s even worse in places like the former Soviet Union. Before the collapse of the USSR, Soviet officials appealed to American Alcoholics Anonymous members to help them set up AA groups in their country. However, because the Soviet Union was officially an atheistic nation – it was actually against the law to believe in God – they asked that the first three steps to be taken out. The Americans refused, stating that the first three steps are the basic ingredients to the success of the program. God is important to the healing that can happen through AA. And members of AA realize that they not only need God’s help but the support of people around them. Becoming free from our demons is never a “do-it-yourself” project. You and I need God to free us from our demons. We also need the support of the community around us. His ongoing witness reminds us that this is our role too. Jesus sets us free from the demons that possess us. People around us will try to chase Jesus away. Our calling as brothers and sisters in the body of Christ that Jesus commissions us to be part of today is to keep talking, to keep witnessing to Jesus’ work in this broken world, to keep hoping that at the end of the day, everyone will know the love and power of Jesus that they may have been chasing away. Brothers and sisters in Christ, when you leave worship today, return to your home, and for the sake of the good news of our risen savior Jesus Christ – tell someone, open your eyes and tell someone, about how much God has done for you. Amen. This entry was posted on Wednesday, June 26th, 2013 at 2:39 pm	and posted in Recent Sermons. You can follow any responses to this entry through the RSS 2.0 feed.